It's true. 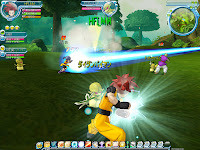 There's a DBZ MMO. It's called Dragonball Online. But it doesn't appear to be out yet. And it looks like it's in Japanese. But it might run in a browser window. Can you say Kame-Hame-Kaching? Thanks to Tim, of Pac-Gentleman fame, for sending me the link.